FACT CHECK: Did N.C. Republican Candidate Russell Walker Say 'God Is a Racist and a White Supremacist'? Did N.C. Republican Candidate Russell Walker Say ‘God Is a Racist and a White Supremacist’? Russell Walker, a Republican candidate for the North Carolina statehouse, has made no secret of his racist and anti-Semitic views. 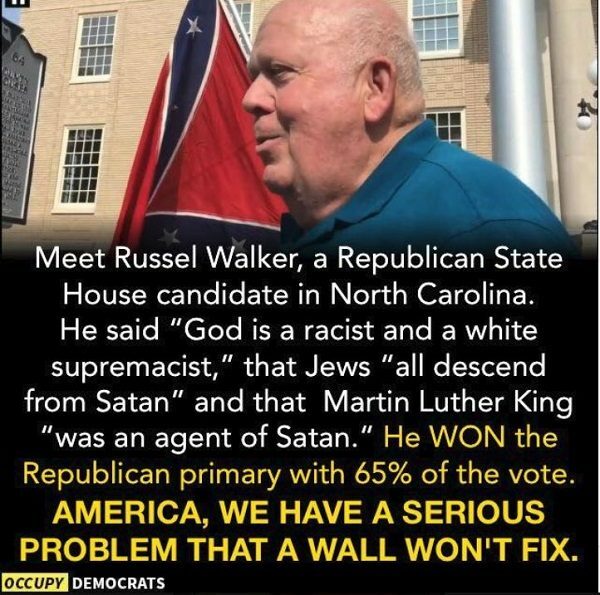 Russell Walker, a candidate running as a Republican in the North Carolina general election, said 'God Is a Racist and White Supremacist' among other racist comments. Russell Walker, who is running for the North Carolina state House of Representatives as a Republican, made racist comments that include "God Is a Racist and [a] White Supremacist" on his web site. Although he's listed as a Republican, the official state party doesn't support him. Aside the misspelling of Walker’s first name, the text of the meme is generally true — although the effort to paint Walker as a flag-bearer for an increasingly racist Republican party is somewhat exaggerated. It’s true that Walker won a 8 May 2018 primary and will therefore be the Republican candidate in the 6 November 2018 general election, during which he’ll face Democratic incumbent Garland Pierce in a race to represent District 48 in the North Carolina state House of Representatives. The North Carolina Republican Party, however, has not only pulled their financial support from Walker, but they have also barred him from the party’s events and property. Dallas Woodhouse, the state’s Republican party executive director, told us that District 48 is solidly Democrat, and the likelihood of Walker’s winning it is therefore low. “We will be likely passing a formal resolution that asks Republicans not to vote, or vote for someone else, which is extraordinary for our party to do,” Woodhouse told us. Although it’s true Walker won the Republican primary with 65 percent of the vote, Woodhouse pointed out that voter turn-out in the primary was very low. District 48 has a total of 52,828 registered voters, according to state data, but Walker received only 824 votes. WHAT IS WRONG WITH BEING A WHITE SUPREMACIST? GOD IS A RACIST and a WHITE SUPREMACIST. The latest and the most demonized expression in the English language, surpassing hate and racist is — “White Supremacy”. Well someone or group has to be supreme and that group is the whites of the world. As explained in detail in another section of this website, there is no such thing as equality. Someone or something has to be superior and someone or something has to be inferior. That is just such a simple fact that it needs no explanation. Just look at science and inventions, world and space exploration, morbidity and mortality, wealth creation, music and literature and medicine. In all history in sub-Saharan Africa, no two-story building or a waterproof boat was ever made. This simple and observable fact is reflected in the Bible not that any of the mainstream religious organizations will ever mention this verse. Deut 7:6 For thou (House of Israel) art an holy people unto the LORD thy God: the LORD thy God hath chosen thee to be a special people unto himself, above all people that are upon the face of the earth. ​We live in a world and universe of inequality. If something is above then of necessity something else must be below. The Southern Poverty Law Center — the ultimate hate group because while they decry hate they are not just haters but ultimately just hypocrites. On 26 June the Southern Poverty Law Center (SPLC) of Montgomery Alabama found out that I had authored a website “Christdescendedfromjoseph.com”. They contacted the North Carolina Republican Party and the next day the North Carolina Republican Party “disavowed” me. This action created a nationwide news sensation. I had wanted to run an issues-only campaign without the inflammatory side show of race, “white supremacy”, “Confederate flag” etc. The SPLC has changed the nature of this race and their threats needed to be responded to. I hope that the voters of Hoke and Scotland Counties do not allow this anti-christ (John 2:22) jewish group to do their thinking for them. The Confederate flag never shot 17 year old teenagers in the back. The Confederate flag never ransacked people’s homes nor terrified anyone during a search. The Confederate flag never conducted a crooked criminal trial while unfortunately innocent people have been sent to prison. The Confederate flag never sent anyone to jail. The Confederate flag never tortured anyone in prison. The problems in Hoke and Scotland Counties are severe and will not be solved by name-calling distractions. It was Christ, not Russell Walker, who told the jews that their father was Satan and that they lusted after the desires of their father. John 8:44. The jews cried out, his blood be on us and on our children. Matt 27:25. Revelation 2:9 and Revelation 3:9 tell us that those who call themselves jews, are not, but are the synagogue of Satan. I did not write the bible. I only quote from it. NBC News reported more white supremacists sought public office in 2018 than at any other time in modern history. For example, James Allsup, who marched in the deadly 2017 Charlottesville white supremacist rally, was elected as committee officer for Precinct 129 in Washington state’s Whitman County as a Republican. Southern Poverty Law Center. 27 June 2018. WalkerforHouse48.com. 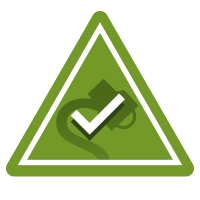 Accessed 2 July 2018. The Daily Beast. 5 June 2018.